Here at The Boarding Call, we travel. We travel a lot. Much of that time is spent flying inter-Asia routes, which means choosing a Low Cost Carrier (LCC), for flights under 5 hours. It just simply isn’t worth it to burn miles on these short flights sometimes. What that means for us, is flights outfitted for a Spartan, lack of creature comforts, and a more bring-your-own mindset. We love our travel accessories. So, starting off with the easiest to buy, no brainers – to the more well thought out items. These are our must have items in the travel accessories checklist. Battle tested… in both business and economy class. 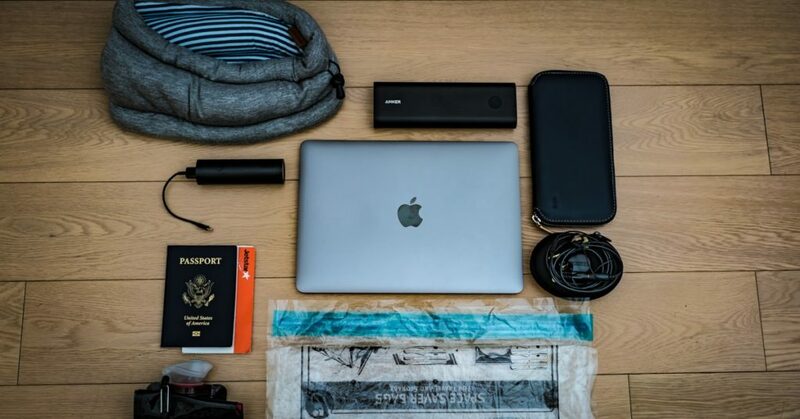 The Absolute Must Have Travel Accessories and Equipment Checklist as recommended by the folks at The Boarding Call who have flown way too many LCC flights for their own good, list. 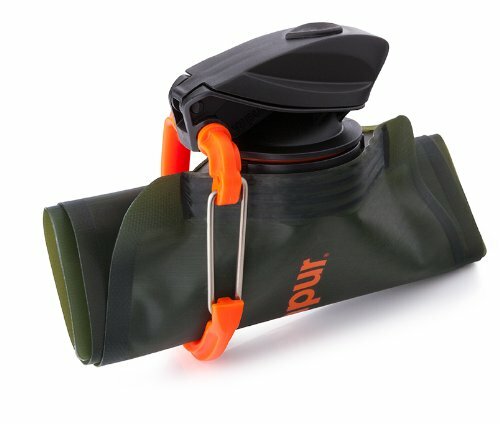 A space saving, collapsible, rollable, water bottle. First on our list is hydration. If you’ve read our guide on How to Survive Economy on International Flights, hydration is a top priority. Since the security restrictions were put in place after 2001, you can no longer easily bring liquids through security. Now, it’s also been adopted in Japan, and other countries as well. Our favorite, and we have three of them, is the Vapur Eclipse Water Bottle. Surprisingly durable, easy to clean, and easy to stow away. This bottle earns our recommendation. Buy it on Amazon. Scroll on for more travel accessories. A head cushion that’s also an eye mask, a scarf, and a makeshift neck pillow. We don’t like neck pillows. They’re awkward to use, push your head away from the seat back, and really don’t offer that much support. The good ones are bulky and a pain to carry around, the easy ones to carry around never satisfy. Our solution is to just not use one. Use the bendable wings on the head rest, use the cabin of the plane if you’re in the window seat, and use one of these. Since we’ve purchased our Studio Banana Things Ostrich Pillow Light, our neck pillows have been collecting dust. We’ve even started using these on our commute on the train. They’re not terribly ugly, not weird like the original one, and definitely does all the things we want. Oh yeah, and it’s definitely comfy. Because of how versatile it is, and how small and light and easy to carry, this saves our weight and space. It earns our recommendation for creature comforts when the airline didn’t give you any. Buy it on Amazon. 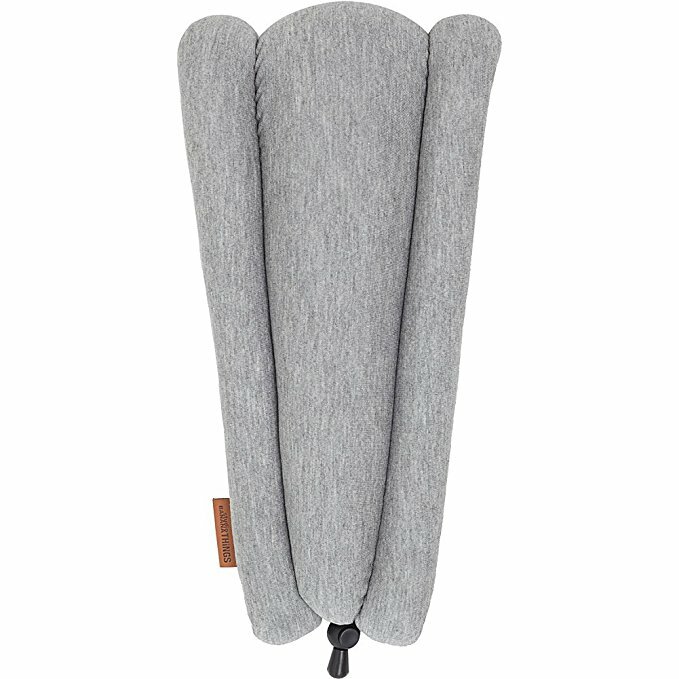 If you really need a traditional neck pillow, we recommend this one, it’s tried and true. We just think the Ostrich is better. Interested in more travel accessories, scroll on! The “oh no, I need all this stuff but don’t want to purchase checked baggage” magic bag. If you’ve flown LCC’s before, you know exactly what I am talking about. Purchasing checked baggage defeats the purpose of flying an LCC. Once you’ve added two ways of checked baggage, you might as well have flown on a flag carrier or full service airline. 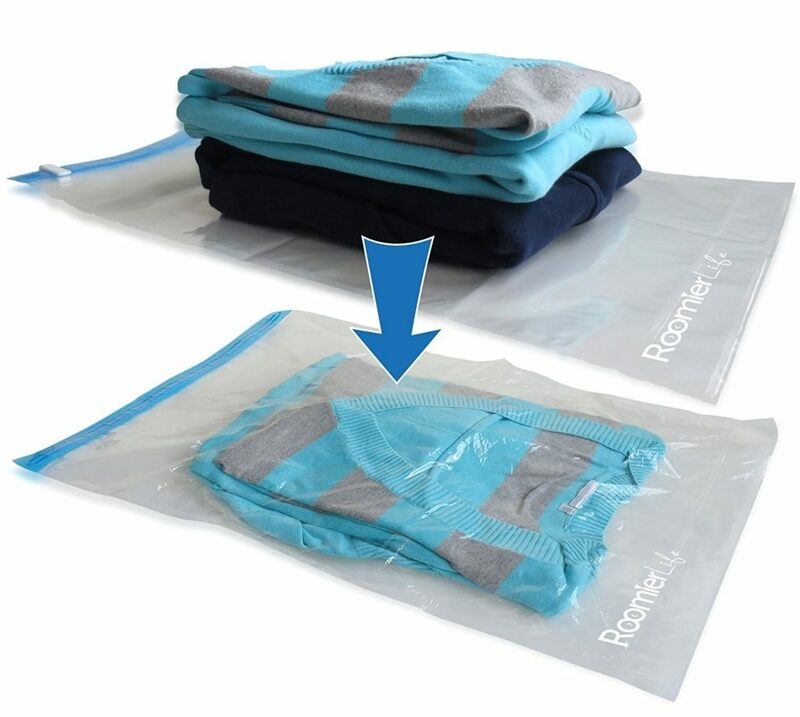 Fortunately, the Japanese have invented vacuum pack storage bags that don’t need a vacuum cleaner to use. It’s quite ingenious, and we love ours. We have more than we can count. Medium is the perfect size for your carry on, Large is great when you need to tackle bulkier items, like winter jackets and fluffy, bulky gear you take with you when you travel to Inner Mongolia in the middle of winter. This kit comes with 4 Large and 4 Medium. Buy it on Amazon. 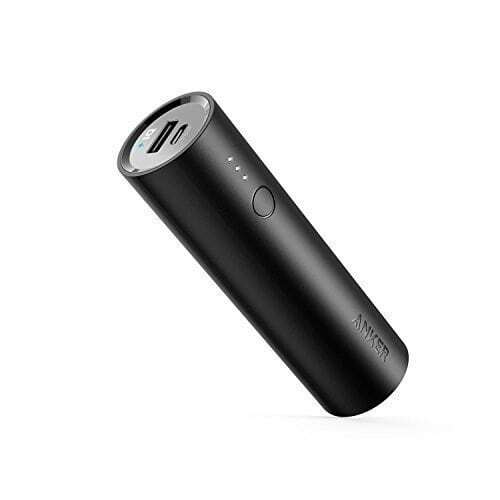 Scroll down for our favorite travel accessories for power. My phone is dead and I can’t find the USB ports on this plane, oh wait! There are none because it’s an LCC! Yes, we’ve been there and we’re used to it. Fortunately, power banks exist. Although there are many, we recommend two. A big one for when you need power for the whole flight, and a small one for when you don’t. There are many brands that you can buy, but we trust our devices and our sanity to Anker. They are hands-down, the best, most reliable, and durable power banks we’ve ever used. They have all the right markings on them, so when the security agents in Bangkok thoroughly inspect yours, they won’t chuck it in the rubbish bin. This 20100 mAh Anker Power Bank has been with me for two years now. It’s powered my phone, my seat-mate’s iPad, and my MacBook for long-haul flights. All at the same time. It’s taken falls onto concrete, and even served as a makeshift hammer when I needed to pound a hinge pin back in place. You would not catch me without this on a trip, ever. Only available on Amazon. Just like the big one, this has all the right markings to make it past security. It’s durable, too. However, this is the one I carry with me in my pocket, and every day. It carries multiple charges for my phone, enough to last me two days without needing a power outlet. About the size of a large lipstick for ladies. Once again, only available on Amazon. As a side note – this one pairs best with a tiny Lightning cable. We like nice travel accessories and things, too. Now that we’ve gotten the must haves out of the way, there are a few things that we find are less disposable, and more researched purchases. Although we try to use all of our items until their end-of-life, the ones below are the ones we have sentimental value with. A wallet that holds everything, including the kitchen sink, but small enough to fit in a jacket pocket. Our search for the perfect wallet ended with this. Paired with a slim card holder to quickly tap at train station gates, this is our recommendation for the do-it-all, and look doing doing it, wallet. 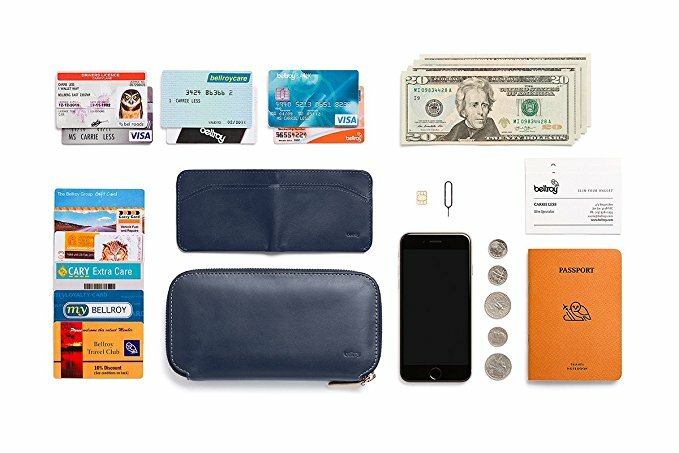 The Bellroy Carry Out. This thing does it all. It holds your cards, your cash, another country’s cash, your passport, and coins. It even holds your phone, and has a place for a sim ejector and an extra SIM card. It has a magnetic smaller wallet that you can detach and take with you on lighter days. We can recommend no other wallet. This is the one. Get one for yourself, or two. Keep scrolling for more travel accessories. Have you ever tried sleeping with those big Bose Headphones? Yeah, doesn’t really work well, so try these. I’m just not sure how people do it. Especially when you need to lean your head on anything. Sleeping with any big headphones just doesn’t work. We prefer earphones here at TBC, but sometimes you just need some isolation from the cabin noise. We recommend the Shure In-Ear-Monitors for flying. Everything, else – the AirPods I just got are mighty nice. When it comes to Shure, any one in their range of models is fine. Just get the one that fits your budget. They all have replaceable cables, great noise isolation, and a plethora of tips for you to find your perfect fit. Not to mention a great warranty and excellent service. Our happy medium is the SE425. 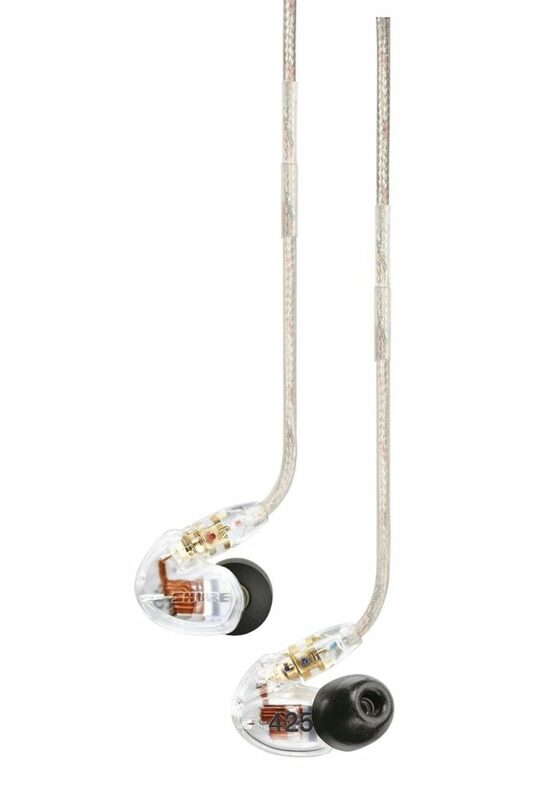 My favorite is dual driver, great sound staging, excellent bass, clear and non-fatigueing highs. Yeah I’m a bit of an audiophile. Find the best deal on Amazon. The iPad doesn’t fit into my workflow, but the MacBook Pros are too big and heavy to carry around. Honestly, this is the best laptop I’ve ever used. Even though my workhorse is a 15″ MacBook Pro, I don’t feel like I miss out on anything when I travel only with my 12″ Retina MacBook. It’s light, it’s powerful enough, has a great battery, and most importantly, runs all of my MacOS apps. It comes in many different colors. But my favorite feature is that I can use my big Anker power bank to keep this thing running for days when I’m away from an outlet, or on a plane. 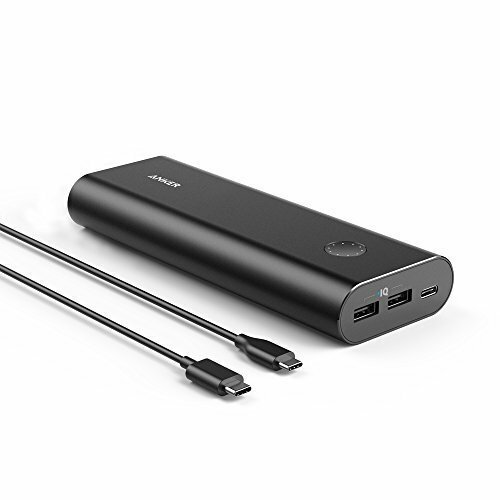 That’s the power of USB-C.
All I need is this and a few dongles. I’m set for being on the move. You can get it on Amazon, but you really should buy it from Apple directly. What credit card should I use to make these purchases? It’s also no secret that we travel a lot with miles here. 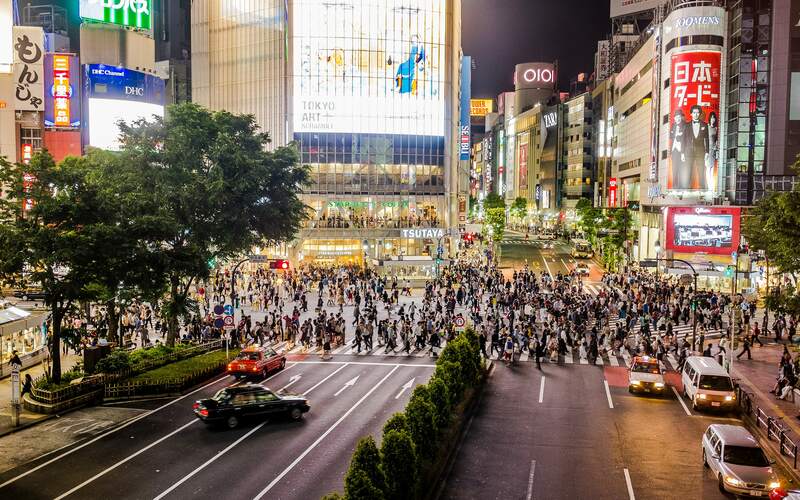 Luxury, BusinessFirst cabins on ANA, United, and more. We’re trying to get on Singapore suites next. Our highest recommended card is the Chase Sapphire Preferred – Earn 50,000 bonus miles (good enough for international business one way, or domestic first round trip!). When you meet the minimum spending requirement in the first 3 months. These are almost all of my travel necessities, minus for photography gear, luggage, and some odds and ends. Those are all personal preference and should be felt and touched before purchasing. Just email me if I missed anything. Want the latest updates? Subscribe to our newsletter, The Boarding Announcement on the right side of the page.